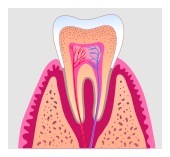 Root canal treatment is the process of going inside the pulp space and removing the infected, dead tissue. The space is then disinfected and sealed with special materials. Nowadays, root canal treatments are performed with advanced techniques and materials, making them far more comfortable and faster. After root canal treatment is complete, Dr. King will usually place a crown on your tooth to safeguard against fracture. If you have any questions about root canal treatments and you live in Conway or surrounding area, give us a call today! This entry was posted on June 13, 2013 by admin100313.